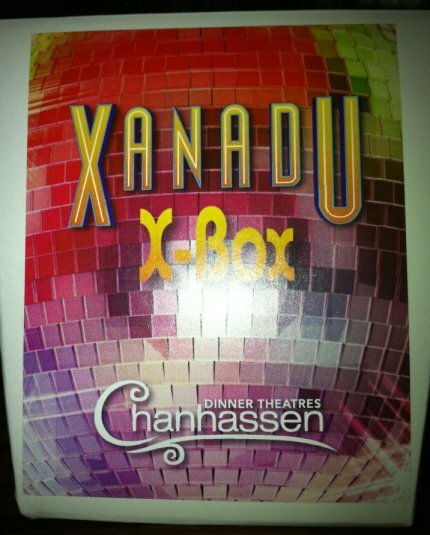 I was fortunate enough to be invited to Press Night* at the Chanhassen for the Midwest premiere of their summer musical, Xanadu, and I have to say, I think it's the most fun I've ever had at the theater! Xanadu is a parody of the 1980 Olivia Newton-John movie flop of the same name, and Douglas Carter Beane (who wrote the book of the show) has done a fantastic job of creating a clever, funny, silly, campy piece of theater that manages to make fun of itself at the same time that it celebrates creation and the arts. The Chanhassen always does a good job with their shows, but this is a really excellent production, the best I've seen there in years. The cast completely commits to the camp of the piece, as directed by Artistic Director Michael Brindisi, and that's what you have to do. There's no halfway with this show, you have to go all in or it doesn't work. And they do. The plot of the show is an odd mix of Greek mythology and 80s references, with some 40s dance numbers thrown in. Sonny is a Venice Beach artist who has lost his inspiration, when Clio the muse (along with her sisters) steps out of a mural and disguises herself as the roller-skating legwarmer-wearing Australian-accented Kira to help him. Together, they fix up an old theater to open a roller disco, where music, art, dance, and athletics combine. Meanwhile, Kira's evil sister curses her to fall in love with the mortal, which is forbidden by their father Zeus, so she is exiled to the netherworld. Sonny follows Kira through the mural to Mount Olympus to declare his love for her. (Yes, I know, it's ridiculous, but just go with it!) Amidst all of this silliness is some clever commentary on the current state of musical theater (all of the muses left in 1980, leaving only poor cinematic adaptations, and the box that is juke), including an Andrew Lloyd Webber dig! This is a show that doesn't take itself too seriously; it's in on the joke. Jodi Carmeli as Kira is the star of this show. Totally immersed in the camp, she floats around the stage on her skates, speaking with an exaggerated Australian accent, and her gorgeous singing voice sounds uncannily like Oliva Newton-John at times. Dieter Bierbrauer (one of my faves) is an excellent choice to play Sonny. He also walks that fine line of camp and sincerity as the sweet but slightly stupid California artist dude (and he's a natural on roller stakes, methinks he's done this before). A silver-maned, big-voiced Keith Rice is great as always, playing a business man who once had a muse of his one. In a flashback, we see his younger self (the Gene Kelly-esque Mark King) singing, dancing, and being inspired by a muse who looks an awful lot like our Kira. The muses are all wonderful, especially Kersten Rodau, who totally hams it up as the evil muse, and Seri Johnson, as her slightly nerdy sidekick (and a second role that's equally hilarious). The two of them cackling and plotting together are a hoot! Finally, I was waiting the entire show to see Cat Brindisi (aka Wendla from Theater Latte Da's brilliant production of Spring Awakening), but she only appears briefly at the end. Still, it means that she hasn't moved back to New York City yet and is helping out with the family business this summer. Maybe we can keep her around a little longer. The set is pretty simple and the stage is considerably smaller due to the onstage seating. The costumes (by Rich Hamson) are super fun, ranging from drapey Greek gowns, to bad 80s cliches, to a centaur and Medusa! And you gotta love a musical that has both a choreographer and a skating coach. The music (by Jeff Lynne and John Farrar) is from the 1980 movie, so it has that great cheesy nostalgia (I just downloaded the soundtrack and will likely be singing along with it in the car with the top down all summer!). Xanadu is the perfect summer show - light and fun, clever and silly, very refreshing and entertaining. There are limited seats available onstage, which on Press Night seemed to be reserved for local TV celebrities, including Don Shelby (aka the narrator of The Rocky Horror Show). So if you'd like to be part of the action, call the box office for details (but don't say I didn't warn you!). There are also participation kits available for purchase (ala The Rocky Horror Show), which include disco balls, glow sticks, and other assorted goodies. All of this, along with the great material and spot-on execution, makes for a ridiculously fun summer party at the theater. This is a fairly limited run for the Chanhassen, just four short summer months, so get out to the Southwest suburbs while you can! *I received two complementary tickets to Xanadu, along with food and drinks (thanks to the official drink sponsor of the show, I now have a new favorite summer drink). But I loved the show so much that if I lived closer, I'd happily pay full price to see it again!